If you like beaches, then you must have the desire to own a beachfront property. The luxury condominiums that are located on the beautiful beaches around the world are the best beachfront properties that one can own. You may stay in these luxury condominiums permanently, or you may keep them as vacation properties, and stay there with your family and friends during the vacations. The lavish and wonderful lifestyle that you get in these luxury condominiums is unparalleled and matchless, something that you cannot expect to get anywhere else. 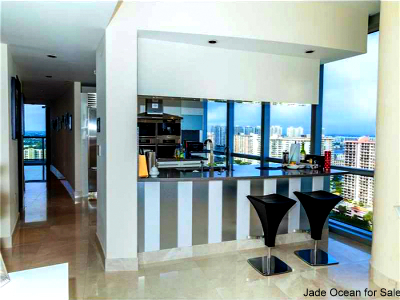 The Jade Ocean condominium on the Sunny Isles Beach in Miami, is one of the most beautiful and popular luxury condominiums in the Sunny Isles area. The Sunny Isles Beach serves as the ideal location for these condominiums, as this place is extremely beautiful and well-connected to all the notable places in Miami. The famous architect and designer Carlos Ott has beautifully designed the building and the structure and design of the edifice are undoubtedly one of the best in the entire Sunny Isles area. There are various reputed real estate agencies that offer the units of Jade Ocean for sale. If you are desirous of buying the units you may contact these well-known realtors. The amenities and services offered in this condominium are outstanding and the residents feel contented and pleased by getting these astounding facilities and services. At the entrance of the building there is a three-storey lobby that offers great views of the ocean; a splash deck for the children to have fun; the residents can enjoy in the infinity-edge pools; there is a private beach club with a café and cabanas, where the residents can refresh themselves; full-time concierge and security services; covered parking areas, car wash and valet services; fitness center and gym, which help the residents to stay fit and fine; meeting and conference rooms are also there; and many more. The units are spacious and have a variety of luxury amenities, such as smart home technology, an in-home touch screen device, which allows the residents to control the room’s’ lighting, contact the valet, concierge and other services, find places to shop, etc. ; the terraces are large and offer beautiful views of the ocean; floor to ceiling glass walls; the kitchens have designer cabinets, European cabinetry, granite countertops, Miele and Sub-Zero kitchen appliances, etc. ; the bathrooms have imported faucets, large vanity mirrors, whirlpool bathtubs, etc. ; large walk-in closets for the residents to keep clothes and other accessories; laundry services are also available; and many more. All these amazing features, amenities and services make Jade Ocean, one of the most desirable luxury condos in the entire Sunny Isles area. The residents get to enjoy all kinds of luxury residential facilities by living in this magnificent condominium.